If you are a regular reader here, you know that we cover extreme music sometimes. 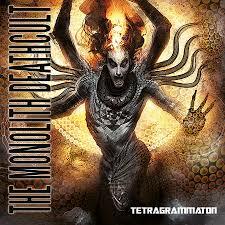 Although I generally not a fan of music this extreme, it goes without saying that I am a big fan of The Monolith Deathcult (TMDC). This Dutch extreme Avant-Garde metal band is exciting to listen to. Each album they have released has been markedly better than the last. That TMDC takes up to five years to conceive, write, and record their music should tell you something about the quality of the recordings. This is a band that is as much educational as it is entertaining. They don't just reference historical events and cultures in their music; such themes embody and even dominate the music. At times oddly cheesy, the band is nothing if not creative. "Tetragrammaton" takes the creativity and unusual song structures and multiplies them by introducing symphonic and industrial elements to provide atmosphere. TMDC has also shown that they don't shy away from including samples from various sources of media. For instance, the first track, God Among Insects, opens with Bill Pullman asking "Can there be a peace between us?" The alien then answers ,"No peace." Independence Day seems to be the basis of the song. As it closes, we hear Pullman asking the alien what it is they want us to do. And the alien answers. This opening track also features TMDC's lead singer narrating a quote from the 1979 movie Caligula. The following track includes a repeated sample from Rules of Engagement. Yet another track references Martin Luther King's famous 'I have a dream' speech. Now that we have some references and background out of the way, let me talk about the music, which is why you are reading in the first place. "Tetragrammaton" is an intense record. In addition to the aforementioned elements, the band incorporates razor-sharp riffing, a furnace of blast beats, infectious melodies, and blistering guitar solos. The vocals are at times hair-raising, ranging from crisp howls to sickeningly guttural growls. This music is not metal for the faint of heart, but it is very good. As anticipated as this album was, I find it difficult to keep off the 'top metal of 2013' list. Check out God Among Insects below. As always, thanks for reading and enjoy!